ARCA is the Automobile Racing Club of America (ARCA), the auto racing sanctioning body founded in 1953. 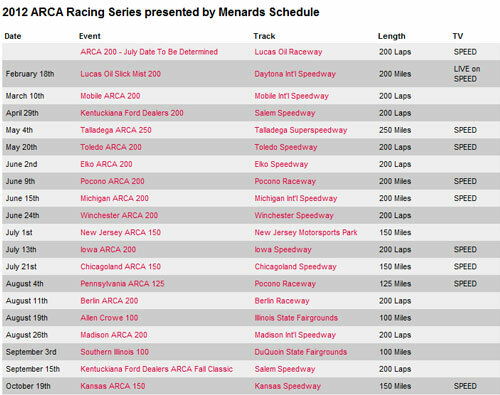 The ARCA/Menards Racing Series races stock cars similar to those in the NASCAR Sprint Cup Series. ARCA started racing at Daytona International Speedway in 1964, during the Daytona Speedweeks, at the request of Bill France, Sr. The ARCA/NASCAR relationship continues today. The series frequently schedules events at the same track on the same weekend. The ARCA event is frequently the Saturday support race to the Sunday NASCAR Cup event. Former NASCAR drivers, such as Benny Parsons and Kyle Petty (who won the 1979 Daytona ARCA 200 -the first race he ever competed in), have competed in and advanced through the ARCA series on the way to successful NASCAR careers. ARCA is still often used as proving ground for hopeful NASCAR drivers.